I’m Ed Smith, a Sacramento Personal Injury Lawyer. The bones are the most likely structures to be injured after blunt chest trauma. They are on the outside of the chest cavity and generally protect the underlying structures. The bones that are likely to be injured includes those discussed here. High-velocity trauma is a major cause of death among those aged 18-44 years of age throughout the world. 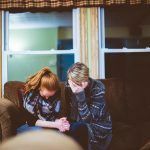 Many die from blunt trauma (80 percent), especially in those aged 34 and under. These types of injuries have cost the US $75 billion USD in lost income alone each year. Seat belts have been perhaps the most important innovation in motor vehicle safety since automobiles were invented. However, even though these devices can greatly improve motor vehicle safety, they can also result in seat belt injuries. 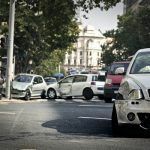 Often this occurs when the seat belts are improperly used, but sometimes it happens even when they are used as intended. 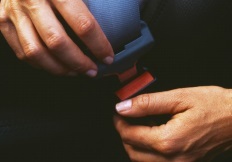 Although the idea of a belt being used to secure a person for safety purposes had been around since the 19th century and had been in use in airplanes since shortly after they were invented, they did not begin to become commonplace in automobiles until the late 1940s and the 1950s when a few auto manufacturers began to offer them as optional equipment. They did not become mandatory equipment in passenger vehicles in the United States until 1968. Airbags have probably been the most significant car safety device to be developed since the invention of seat belts, however even though they can provide significant protection against major injury, they can also cause injuries both when they work as intended and when they don’t. Airbags first began appearing in passenger vehicles in the 1970s, with driver airbags becoming common by the early 1990s, and with vehicles of today now often including both driver and front passenger airbags to protect against impacts from the front and side torso and side curtain airbags to protect against collisions from the sides and rollovers. 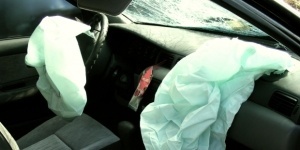 In order to protect a vehicle occupant from serious injury in a collision, an airbag must react with an equivalent significant force — it does this by exploding a pyrotechnic device that rapidly and forcefully fills the bag with gas. Some systems are smart enough to detect the severity of an impact and “explode” the airbag with just enough force to provide protection, but most systems — especially older ones — simply inflate the bag to its fullest. And in the United States, design standards require a more forceful bag inflation than do international standards. 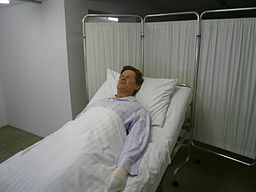 There is little doubt based on safety studies that vehicle airbags offer protection against severe injuries in automobile collisions; that said, the deployment of airbags during a crash can also in and of itself cause injuries – albeit in a vast majority of cases, those injuries were classified as minor. So while data reveals that airbag deployment can cause injuries – most often to the face, upper extremities and torso – those injuries should be considered in the context of the more serious injuries that the deployed airbag prevented. Studies have found that the eye area is especially prone to airbag injury, moreso if the party wears glasses. Such injuries include retinal detachment, lens ruptures and orbital fractures. Also, when the airbag deploys it releases chemicals which can be injurious to the eyes. Children seated in front are at risk of eye injuries due to height/position. However vulnerable the eye/face area appears to airbag injuries, studies have consistently shown that airbag deployment reduces the risk of skull fractures. There have been more motorcyclists on the road in many countries over the last few decades. This has led to an increase in severe collisions and rider morbidity and mortality. There have been improvements in helmet technologies and better helmet wearing strategies that have reduced the incidence of serious injuries to the head. Now, chest trauma is surpassing head injuries and is the most serious injury seen in motorcyclists. Unfortunately, few changes have been made to change the situation when it comes to chest injuries. 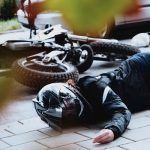 A new study has looked at finding the needed information to help reduce the incidence of thoracic trauma to motorcyclists. In addition, the article looked at helping motorcycle advocates and road officials to develop ideas and put them in motion so that motorcyclists can be safer. Police and hospital data were compiled. The study looked at nearly 20,000 hospital records on motorcycles and looked at all of the particulars of the incidents. 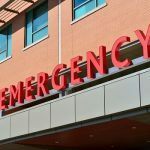 It was found that the incidence of severe chest trauma has more than doubled in the past 2 decades and they comprise 3.2 percent of all registered vehicles. One fourth of all serious chest trauma cases in the hospital have come from motorcyclists. There was an even mixture between fixed object crashes and non-collision crashes. More older riders suffered from chest trauma when compared to younger drivers.